Edwards County is a county located on the Edwards Plateau in the U.S. state of Texas. As of the 2010 census, its population was 2,002. The county seat is Rocksprings. The county was created in 1858 and later organized in 1883. It is named for Haden Edwards, an early settler of Nacogdoches, Texas. The Edwards Aquifer and Edwards Plateau are named after the county by reason of their locations. Early inhabitants are Lipan Apache, Comanche. 1762 Looking for protection from Comanches, Lipan Apache chief El Gran Cabezón persuades Franciscans and the Spanish military to establish San Lorenzo de la Santa Cruz Mission on the Nueces River. The Mission was abandoned in 1771. 1825 Virginia born Haden Harrison Edwards joins forces with Stephen F. Austin and contracts with Coahuila y Tejas for the introduction 800 families into east Texas. The next year, Edwards declares the Republic of Fredonia near Nacogdoches, Texas, an early attempt to secede from Mexico. Stephen F. Austin joins forces with Mexico against Edwards. Haden Edwards flees in 1827 to Louisiana for his safety, later to return and spend the rest of his life in Nacogdoches. 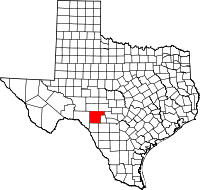 1858 Edwards County is formed from Bexar County. 1871 Clint Smith, age 11, and brother Jeff Smith, age 9, kidnapped by Indians near Rocksprings. 1882 W.J. Greer settles a sheep camp at Rocksprings. 1883 Edwards County officially organized and named for Haden Harrison Edwards. 1884 Francis Winan cattle and sheep ranch at Rocksprings. 1885 A.O. Burr sets up farming at Rocksprings. 1891 County seat becomes Rocksprings. County Courthouse is built by architects Ben Davey and Bruno Schort in the Romanesque Revival Style. 1898 Rocksprings Telephone Company starts up. 1913 Edwards loses land in its eastern section to Real County. 1940 Rocksprings calls itself the "Top-o-the-World" in mohair production, which peaks that year. 1946 Oil discovered in the county. 1991 Kickapoo Cavern State Park, 6,400 acres (26 km2) in both Edwards and Kinney County, opens to the public. 1992 Devil's Sinkhole State Natural Area near Rocksprings, home to the largest single-chambered cavern and third-deepest in the state, opens to the public. According to the U.S. Census Bureau, the county has a total area of 2,120 square miles (5,500 km2), of which 2,118 square miles (5,490 km2) is land and 2.0 square miles (5.2 km2) (0.09%) is water. As of the census of 2000, there were 2,162 people, 801 households, and 586 families residing in the county. The population density was less than 1/km² (1/sq mi). There were 1,217 housing units at an average density of 1 per square mile (0/km²). The racial makeup of the county was 83.26% White, 0.79% Black or African American, 0.79% Native American, 0.14% Asian, 12.72% from other races, and 2.31% from two or more races. 45.05% of the population were Hispanic or Latino of any race. There were 801 households out of which 31.70% had children under the age of 18 living with them, 60.80% were married couples living together, 8.90% had a female householder with no husband present, and 26.80% were non-families. 24.70% of all households were made up of individuals and 13.50% had someone living alone who was 65 years of age or older. The average household size was 2.66 and the average family size was 3.20. In the county, the population was spread out with 28.50% under the age of 18, 6.50% from 18 to 24, 23.20% from 25 to 44, 25.70% from 45 to 64, and 16.20% who were 65 years of age or older. The median age was 39 years. For every 100 females there were 102.60 males. For every 100 females age 18 and over, there were 98.20 males. The median income for a household in the county was $25,298, and the median income for a family was $27,083. Males had a median income of $21,912 versus $14,907 for females. The per capita income for the county was $12,691. About 24.60% of families and 31.60% of the population were below the poverty line, including 47.40% of those under age 18 and 17.70% of those age 65 or over. ^ "The Edwards Aquifer Website FAQ". Retrieved 2010-12-29. ^ a b c d e f g McCrain, James B. "Edwards County". Handbook of Texas Online. Texas State Historical Association. Retrieved 29 November 2010. ^ La Vere, David (2003). The Texas Indians. TAMU Press. p. 122. ISBN 978-1-58544-301-7. ^ McKeehan, Wallace L. "Haden Edwards and The Fredonian Rebellion 1826-1827". Sons of De Witt County. Retrieved 29 November 2010. ^ "Clinton LaFayette Smith". Texas Historical Markers. William Nienke, Sam Morrow. Archived from the original on 18 July 2011. Retrieved 29 November 2010. ^ "Rocksprings, Texas". Texas Escapes. Texas Escapes - Blueprints For Travel, LLC. Retrieved 29 November 2010. ^ McDonald, Archie P. "Haden Edwards". Handbook of Texas Online. Texas State Historical Association. Retrieved 29 November 2010. ^ "Edwards County Courthouse". Texas Escapes. Texas Escapes - Blueprints For Travel, LLC. Retrieved 29 November 2010. ^ "Rocksprings Telephone Company". Texas State Historical Markers. William Nienke, Sam Morrow. Archived from the original on 18 July 2011. Retrieved 29 November 2010. ^ Verby, Sue. "Rock Springs, TX Tornado, Apr 1927". GenDisasters. Retrieved 29 November 2010. ^ "Kickapoo Cavern State Park". Texas Parks and Wildlife Department. Retrieved 29 November 2010. ^ "Devil's Sinkhole State Natural Area". Texas Parks and Wildlife Department. Retrieved 29 November 2010. Wikimedia Commons has media related to Edwards County, Texas.